Back on the job after a long layoff, this time I will turn to a favorite subject…weird tales of the sea! In nautical history, there have been many instances of “cursed” ships…the Flying Dutchman being perhaps the best known example. But haunted submarines? That’s a bit more exclusive club. And while there have been submarines that have met dreadful fates beneath the waves, there’s little doubt that the most cursed sub in history is Germany’s ill-fated U-65. In the early years of the 20th century, Germany’s navy was one of the most dominant in the world. At the cutting edge of technology were the deadly U-boats or Unterseebooten…the earliest mass produced submarines designed for warfare. 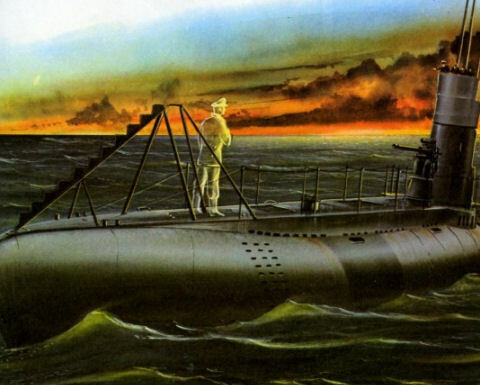 There had been tentative sub designs going back as far the 18th century, including primitive versions used in the American Civil War, but nobody has perfected submarine warfare as much as Germany during the early 1900’s. These craft gave the Reich unprecedented power at sea, which was proven by the sinking of the Lusitania in 1915. Being a sailor on these early subs was an incredibly dangerous job. Not only was there a chance of being sunk in battle, but they often suffered from unforeseen accidents. Those enlisting for U-boat duty were told they had a 50% chance of coming back safely. Conditions were also extremely cramped and claustrophobic. Every voyage was a learning experience…but any wrong move could mean a horrible death beneath the sea. Despite these conditions, many were eager to try their hand at sub duty. The U-65 was one of 14 new U-boats ordered to be built at the shipyards in Bruges, Belgium as part of a drive to increase the fleet. From the very beginning of its construction, the U-65 was plagued by mishaps and accidents. Just after the keel was laid for the sub, a heavy iron girder inexplicably snapped out of its chains and fell on two workers. One was immediately crushed to the death. Another was freed from beneath the girder but then died on his way to the hospital. An examination of the chains holding the girder could reveal no obvious defect. Sailors are a superstitious lot. A fatal accident during construction of a vessel was always taken as an omen that the ship would be unlucky. And in this case, that omen was prophetic. Disaster continued to haunt the construction of the U-boat. Just before the sub was finished, the engine room was flooded with deadly gas when the ship’s electric batteries were being tested. Three members of the engineering crew died choking on the toxic fumes. Already sailors were talking about the “curse” of U-65. German naval command tried to shut down reporting of the incidents and dismissed any superstitious talk. This official suppression of negative publicity was to become a constant feature of the U-65 saga. The craft was finally declared seaworthy and sent out on a test run. An inspection was ordered before the ship did its first deep dive. All was found in perfect working order, but one of the seamen inspecting the upper hull was either washed overboard by a freak wave or deliberately leapt into the ocean for no apparent reason. It was never clear which happened. Nevertheless, U-65 was found seaworthy and did its first deep sea dive. Everything went smoothly and the sub executed the dive to perfection, landing on the floor of the sea. Then more mayhem took place when the ballast tank sprung a leak and seawater hit the ship batteries, causing the vessel to fill with deadly fumes. For the next 12 hours, the crew frantically worked to repair the sub under hazardous conditions. They finally managed to surface and return to port with no casualties, but almost everyone on board was sickened by the bad air inside the boat. By now, no amount of orders from the top could stop the flood of negative talk surrounding U-65. Many of the crew were reluctant to continue serving aboard her, but the German Navy was stubbornly determined to keep the sub in the war effort, which was at a critical juncture. The ship was fixed and sent back to the port at Bruges, where it would be loaded with live ammunition and torpedoes for its first attack against Allied ships. There was no let up in the disasters plaguing the ship. As the torpedoes were being loaded into the sub, one accidentally exploded, resulting in the deaths of six men including Second Lieutenant Richter. But this would not be the last time Richter would be seen on the U-65. The torpedo explosion signaled a new phase in the U-65 story: the vessel now went from not just a cursed one, but a haunted one. When U-65 went out on its first official mission, the hauntings began almost immediately. A petty officer, almost out of his mind with fear, exclaimed that he had seen Second Lieutenant Richter walk silently past him and then stand with arms crossed on the bow of the ship. Richter had been buried the week before. The petty officer was not the only one who had seen the dead man; his account was supported by more testimony. The sub’s commander sternly reprimanded the men for reporting “nonsense” and swore them to secrecy, which was a vain command. Word now quickly spread that U-65 was leaving a trail of ghosts with its constant disasters. Despite this, the U-Boat was effective in its mission of sinking enemy ships. In fact, the sub racked up an impressive total of “kills” during its war-time service. While the sub was floating on the surface after a successful mission, Richter’s ghost appeared once more, standing on the bow with arms folded as waves seemed to pass through it. This time the specter was seen by the First Lieutenant himself, who called the Captain to witness the ghost. There was no denying it was Richter standing like an omen of doom on the bow. When U-65 returned to the naval yards at Bruges after a successful run, stories of the haunting spread like wildfire through the enlisted men. Admiral Schroeder was dismayed at the poor morale the ghost stories caused and to allay fears, he took the extraordinary step of bringing a priest aboard the U-boat to perform a rite of exorcism. He also assigned a new Captain to the craft, despite the good record of the first commander. Gunner First Class Eberhardt was the next to suffer the curse of U-65. During a May 1918 run near the Bay of Biscay, the sub was hunting for Allied targets when Eberhardt encountered Richter. Babbling madly, the gunner had to be subdued and sedated by his fellow crewmen. It was to no avail, for he awoke earlier than expected from sedation and escaped sick bay. Screaming wildly, he jumped into the ocean and was drowned. The next night, Petty Officer Meyer, who had written that foreboding letter, inexplicably leapt into the sea and started swimming. His body was never recovered but he was assumed drowned. In the midst of these evil omens and with the haunting now widely accepted even by the U-boat’s commander, U-65 charged into combat with Allied sub hunters. The U-boats, once unchallenged masters of the sea, were now being stalked themselves by a much better prepared foe. On May 22nd, Allied depth charges found their mark and forced U-65 to the bottom of the sea, where supernatural panic gripped the crew. Many sailors said they saw a greenish glow around the torpedo compartment and others saw Richter’s ghost striding through the bulkhead. Somehow, the sub managed to effect repairs and return to base. There, the commander and crew told their story. Many of the sailors said they would prefer to be shot rather than serve on the U-65 again. Admiral Schroeder relieved the commander of duty and replaced him and the entire crew with an all new roster. The doom which had been shadowing the submarine since the earliest days of its construction was now closing about the ship like a fist. It is unknown what happened in the interim, but on July 18 of 1918, an American submarine cruising near Cape Clear came across a German U-boat floating on the surface in a dangerously exposed position. The U-Boat seemed to be leaning to one side as if damaged. Further inspection revealed that the German was the U-65. Not believing his luck, the American sub skipper closed in for the kill. But before the Americans could fire their torpedo, the U-boat blew itself to bits, raining debris down from the sky. There could be no survivors of such an explosion. The U-65 had finally met its demise in spectacular fashion. The reason for the explosion was never known, since not enough remained to be studied. The bodies of the 37 crewmen were never recovered. One American officer mentioned to the skipper that just before the explosion, he had seen what looked like a German officer standing on the bow of the sub, with arms folded. Could it have been Richter standing his last watch? The exact location of U-65’s sinking was lost in the fog of war. For many years, the spot of its sinking was unknown. In 2004, the wreck was finally located by marine researchers. Despite some intense scrutiny, no reason for the explosion was found. The remains were left where they fell all those years ago, undisturbed by any further investigation. German naval records regarding the U-65 can be examined and all the disasters which befell the ship can be verified by those willing to look. 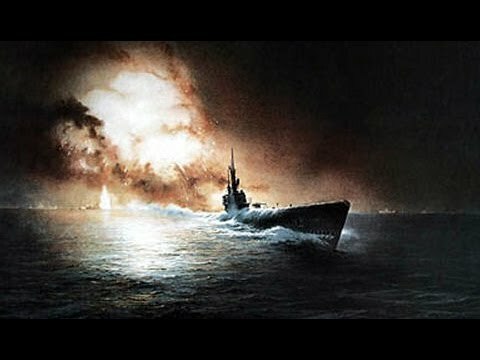 The supernatural aspects of the tale of course are not reported officially, but the legend of the curse of U-65 was passed down through generations of sailors. Those men lucky enough to have served on her and gotten away alive helped keep her story alive. One question which will never be answered is why? Why did this one vessel become such a magnet for disaster? What made it different than the other U-boats built during that time? That’s something we will probably never know. The U-65 is finally at rest deep beneath the ocean waves. Perhaps Second Lieutenant Richter still walks across the bow with arms folded from time to time, holding an eternal vigil. This is Dr. Abner Mality, turning out the lights.